Rajasthani Writer Vijaydan Detha passes away. Rajasthani writer Vijaydan Detha, who gave a modern touch and identity to folk tales of the colourful desert state, died in Borunda village today following a cardiac arrest. Detha, 87, is survived by three sons and a daughter. "He fondly documented them and converted them into the form of stories", said Vinod Vithall, a close associate. 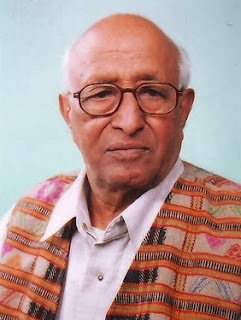 Vijaydan Detha ( 01 September 1926-10 November 2013) also known as Bijji was a noted writer from Rajasthan and a recipient of Padma Shri award. He was also recipient of several other awards such as Sahitya Akademi Award and Sahitya Chudamani Award. He has more than 800 short stories which are translated into English and other languages. He was co-founder of Rupayan Sansthan with late Komal Kothari, an institute that documents Rajasthani folk-lore, arts and music. His literary works include Bataan ri Phulwari (garden of tales), a fourteen volume collection of stories that draws on folk-lore and spoken dialects of Rajasthan. His stories and novels have been adapted for many plays and movies including Habib Tanvir's Charandas Chor'Prakash Jha's "Parinati" and Amol Palekar’s Paheli. 'Paheli', a movie based on his story "Duvidha", was the last film based on his works.